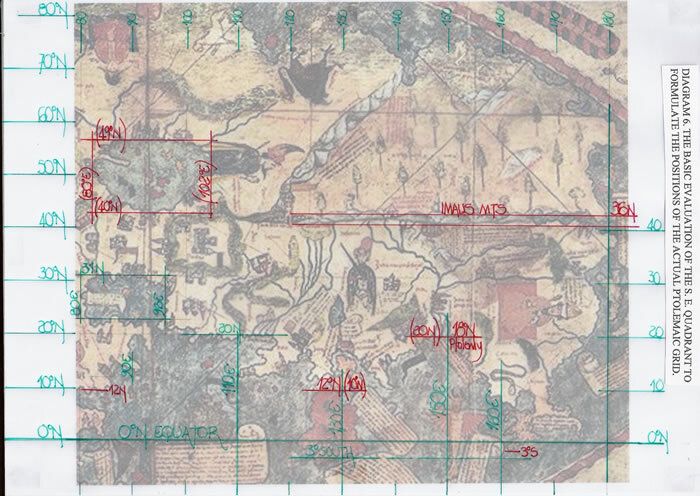 The art of mapping is an ancient profession requiring geographical knowledge and technical ability to portray the data collected onto a flat parchment, whereby the reader can abstract information and learn the form of the oikoumene. All too often research texts’ concerning early maps concentrates upon the visual feast that the cartographer has provided as adornment or the storyline of the text cartouches appended. This is very acceptable research as from it we learn of the knowledge available at the time of the maps conception, how travellers have described landscapes and how the cartographer has incorporated that knowledge. But, in virtually every text written, including the most respected tome regarding cartography, –The History of Cartography– published by Chicago University, there is no definitive forensic examination of how maps were drawn which will enable a full understanding of the process required to draw the basic map. If the basic map was not drawn, constructed by geometric means, both simple and complicated, there would be no -canvas- to add those cartouches, animal or human sketches or fanciful grotesques from the historical record and mythology. This myopia may be likened to the adage, -cannot see the wood for the trees. “Cartography and geography in particular are closely connected, as various examples will show, since the former, as everyone knows, is concerned with depicting the facts that the latter studies. Cartography makes very useful contributions to our understanding of geography, illustrating graphically the territorial distribution of phenomena. Thus the history of cartography is closely linked to the history of geographical exploration and the history of geographical thought and theories. It builds on their results, while also making possible further developments or actually stimulating new initiatives. The historical development of cartography itself contributes considerably to geographical science as a whole, through its own constant updates and modification as it advances. Without the depictions made possible by cartography the comparisons that constitute the soul of geography could not be realized. Nowadays there is often talk (possibly too often, in my opinion) of the image of the territory created by the people who live there or travel through it, and much space is given to the related discussions about the means through which such an image is formed and passed on by way of the most diverse experiences. Thus we end up discussing so-called mental maps of contemporary humans in the field of what is called the geography of perception, logically linked to semiology, that is the science of signs, of which the symbology of maps is only part. I do not deny that dwelling on reflections and meditations of this kind, as for any intellectual activity, can serve some useful purpose in today’s human geography. On the other hand, advances in geography, as in any other science, cannot leave unexplored any of the lateral or related branches, from which helpful contributions may come at any time. I personally do not believe, however, in a typology of exceedingly specialized geography, nor in the mania for novelty, nor in the resulting abstractions, distilled in one’s study with such elaborate sophistication. On the contrary, I am convinced that cartographic documents of the past cannot be adequately studied and understood unless one first takes into account the culture that they express (and the methods by which they were constructed), on the one hand, and the aims and objectives for which they were intended, on the other. In other words, the depiction of the earth, and its evolution, are part of a system of thought and communication that is tied to, and a function of, the different eras and their means of expression. Within this perspective it is possible to overcome the ancient and deep- rooted habit of appraising the cartographic document of the past only according to whether it corresponds to geographic reality as we know it today, or better yet, whether it conforms to the mathematical rules of modern science, which governs how such a reality is to be represented. The latest text 2 concerning the 1457 World map, excellently written and informative as it is, does not grapple with the main thrust of Professor Ferro’s text, the construction method, even though the graticules were featured in the article. I believe it is necessary to redress the balance so that by combining Brunnlechner’s paper which fully explained the decoration of the 1457 map, with this essay focusing on the initial phases of its drawing and construction before the decoration was appended, hopefully a comprehensive overview of the map will emerge. The 1457 Map, Basic Description. 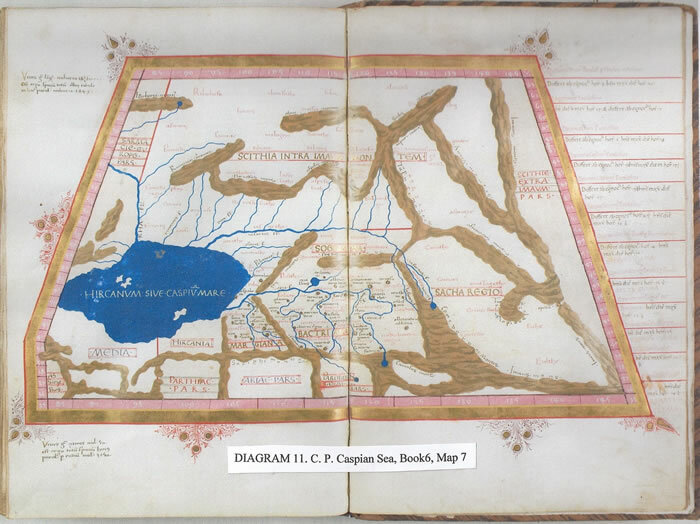 N W Quadrant: encompassing the zone of Europe from the southern Mediterranean littoral to the Arctic Ocean, which by 1457 had been mapped for two centuries and Portolan Charts3 exist to amply illustrate this point. The eastern extent is, as with most of the Portolan Charts, the furthest limit of the Black Sea, the Pontus Euxine and Georgia. Not only had ancient Greece and Rome explored and settled these littorals but the later contenders Genoa and Venice, among others, colonised these areas as well. Thus we should expect any map to portray a reasonable geographic representation of Europe, and this is reflected in this map. When Claudius Ptolemy c150AD in his “Geographia”8 ignored this important text, Africa was doomed to be portrayed wrongly until the Portuguese again rounded the Cape of Good Hope in 1487-1488. N E Quadrant: encompasses wild and largely uncharted, unexplored lands, but the southern portion includes the Silk Road to Xian China, which was known to the Romans who imported silk. Part of this route was taken by Alexander the Great and is of course the subject of the texts of Marco Polo (1254?-1324) and Niccolo De Conti (c1395-1469) the Venetian traveller or merchant-adventurer who reached southern China. The dividing line of this quadrant is formed by the Imaus Mountains, now the Himalayas, which Claudius Ptolemy places correctly at 36N. S E Quadrant: extends from the Red Sea to China in the east and from the Imaus Mountains to below the Equator, and is basically the Indian Sub-Continent and the Far East. 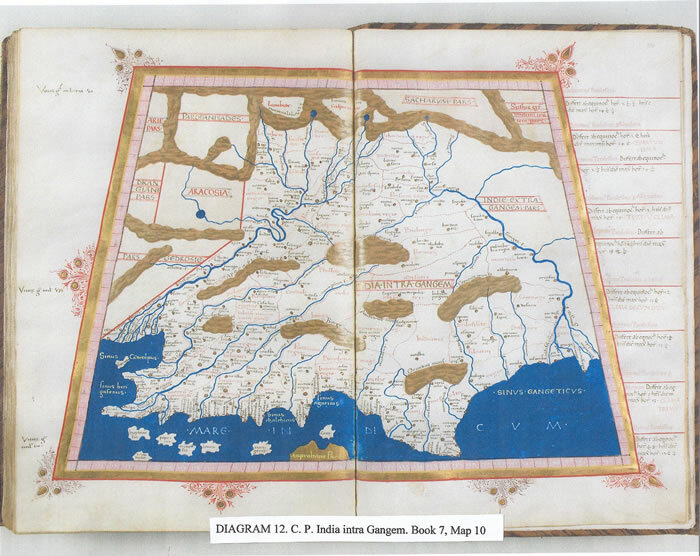 What has been drawn in the 1457 map undoubtedly reflects the co-ordinates of Claudius Ptolemy, Book 7, Chapter 1, India, this side of the Ganges. This includes the island of- Taprobane- and the -Golden Chersonesus- from the same book. But it should be noted that the map of India as attributed by Strabo to Eratosthenes9 is a rhomboidal shape having nearly same length sides (16000 to 19000 Eratosthean stades), which on examination is found to be correct geographically. The island of ‘Taprobane’ is crossed by the Equator which can be used to determine a base for latitude. Having briefly described the 1457 World map, we can now proceed to a forensic examination of the methodology by which it was conceived and constructed. The examination was carried out on two sizes of the chart; one full size, c.82 x 41 cm and the second ( and a third actually) which was c.67% scale. The attached diagrams use the same base map, although only A4 in size for continuity of draughtsmanship and detail. The form of the bordure has been variously described as “almond” shaped or “eye- shaped”, but it could also be a variant of the vesica piscis of Christian symbolism as Diagram cg1457/D02 indicates. Brunnlechner10 argued that without any obvious Christian symbolism and the secular symbolism features such as coats of arms, indicated it was a pragmatic shape. I argue that this view overlooks the 200-year tradition of mapmaking in the region by the monastic community in which the greater probability was the use as a well-(loved) known form by the cartographer. It could also have been requested by the map’s patron. But the real importance of the shape is that the bordure lacks symmetry, especially the non-alignment to the internal graticule drawn therein. The cartographer cannot have been unaware of the disparity as he drew it, though the reason for the problem is very simple. Diagram cg1457/D03 (although drawn to a small scale), illustrates the intent of the cartographer. The upper part of the diagram has the geometric forma as no doubt originally intended. It produces regularity for the bordure and enables scale to be introduced via its squares. It is the basic method whereby a shape can be set out and the scale controlled. This is further signalled by the greater radius with its ratio keyed to the width of 3:2, and thus there is pure geometry in the –almond- form; it is not a shape imposed after the fact. The internal graticule sets the whole figure on the parchment and is based upon a 1:2 frame which of course emulates the shape of the oikoumene as used by ancient geographers, Eratosthenes, Ptolemy etc. The radius centres are located by this rectangular graticule, being precisely one square extra north and south of the basic oikoumene rectangle and thus geometrically correct. The second part of Diagram cg1457/D03 is a comparison of the putative forma and the actual forma for the –almond- shape bordure. The problem, as can immediately be seen, is one of an error in draughtsmanship. 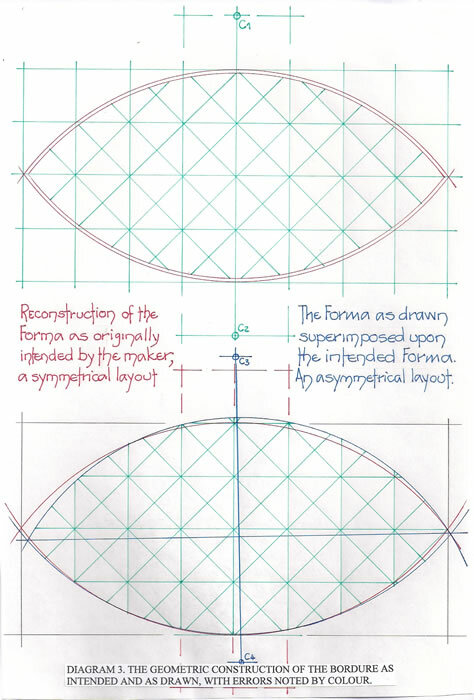 It is obvious from the size of the vellum used that the centre points for the design shape were not located upon the vellum or parchment sheet, which would in all probability be affixed to a table or similar for the drawing exercise. Thus there was probably no real alignment for the vertical centre line, which would of necessity have had to have been extended outwards from the vellum onto the table or screen, and, the draughtsman –guessed- the appropriate centres for the curves of the bordure and produced an asymmetrical –almond- shape. This is of course a key to the order of construction of the map. The internal graticule was first drawn using (probably) a lead (plumbum) stylus11 (no graphite yet?) and then the bordure was drawn across the vellum surface. For the remainder of this essay the bordure errors here will be ignored. In her article, in figure 2, Brunnlechner illustrated the “So-called Genoese World map, with rhumb lines retraced by the author.” But, unfortunately, this obscured the logic of the original format, the necessary order of drawing, hiding the real purpose of this graticule and its implications. Of course, this though was not the purpose of her article, which studied the map’s spatial conception. Nonetheless the interpretation could be strengthened and better portrayed by understanding that space had to be determined both geographically and by measurement, that is the graticule. To make this evident, Diagrams cg1457/D02 and cg1457/D03 herein have the simplified graticules. To explicate where the misunderstanding might have occurred, it is necessary at this juncture to quote directly from Brunnlechner’s article. “The mapmaker painted two scales outside the map’s frame, one indicating 100- and the other 50-mile increments. Whether the mapmaker took measured distances as the basis for his scales or whether he painted scales as pretence is irrelevant to a study of the map’s spatial conception. The important thing is his purpose, about which we can only hypothesize. Naturally, scales suggest space defined purely by measurement, not space defined by meaning. But this does not automatically imply a homogeneous conception of space. Did the mapmaker want to give every point on this map equal value? Or do the scales just indicate that he valued a near- natural depiction of the world. The system of rhumb lines the mapmaker used is clearly reminiscent of Portolan Charts, whose coastlines are shown on the Genoese map as well. The inclusion of this system could be interpreted as an attempt at spatial accuracy. 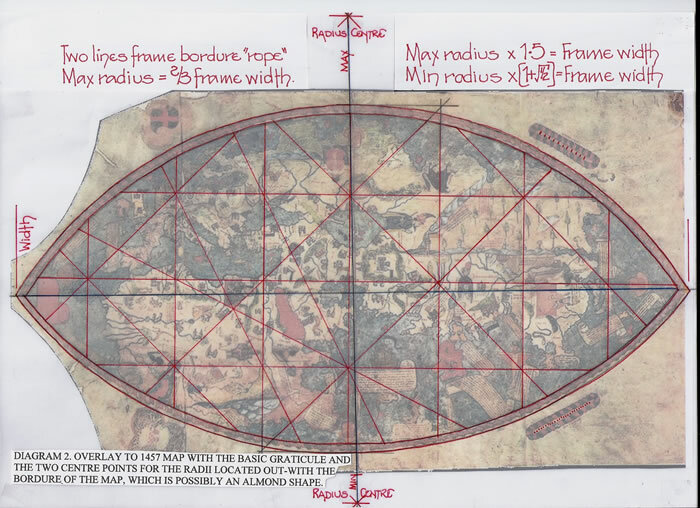 Connecting the frame of the map and its rhumb system, Osvaldo Baldacci suggests that the mapmaker tried to unite Strabo’s scallop form of the world and Marinus of Tyre’s grid. In Figure 2, the lines, still partly visible on a digitized reproduction in the possession of the author, are retraced. Even if these lines are connected to Marinus’s projection, there is not much known about Marinus’s grid due to the lack of source material. However, on the Genoese World map, no projection method was used, and the rhumb line system seems unfinished- either this or it is deliberately concentrated on Europe, West Asia, and the Indian Ocean. If the map is unfinished, this indicates that these lines were not important for the construction or the use of the map. If, on the other hand, the map is finished as it stands, one might expect the rhumb lines to concentrate on the areas modelled on portolan charts. But this is not the case, as the node in the Indian Ocean, about which no measurements were known, is the most prominent one. Moreover, the lines cover much ground onshore, which makes its use for navigational purposes seem unlikely. But, then, perhaps the mapmaker simply wanted to emphasize certain regions. Thus Diagram cg1457/D04 commences with the most basic -rhumb lines- latitudinal and longitudinal markers for drawing the whole map. They are a graticule of latitude and longitude with the southernmost horizontal line passing through –Taprobane- precisely where Claudius Ptolemy placed the equatorial line. The second vertical line from the west then represents the 30E alignment of Claudius Ptolemy which passes through, as is clearly shown upon the map, Sardinia, Corsica and Genoa itself. The city of Genoa is given the co-ordinates of 30E and 400 50’N by Ptolemy. That the two most important alignments upon the map, one which sets out the latitudinal scale and the other the longitudinal scale, the second alignment is clearly denoting Genoa, and points precisely to the origins of the map and its cartographer: Genoa! The setting out could not have been from the west, it is a nebulous alignment of 0E, through, as Ptolemy states, the Fortunate Islands. These are noted there-in as being only 2.5 degrees from the Sacred Peninsula of Iberia, now Cape St Vincent, but, this had been disproven some 300 years previously with the first Portolan Charts, and thus the cartographer has revised it. It most certainly could have been set out from the centre line of the chart, 90E, being half of the oikoumene, but there is a small problem with that. How do you meld a geographically based map of Europe to a Ptolemaic based map of the rest of the world? The answer is to locate two fixed matching lines, as Diagram cg1457/D04 illustrates. One through Sardinia, Corsica and Genoa, 9W geographically, which is also the Ptolemaic longitude of 30E, and therefore a perfect alignment. Yet, it is not that the geographical longitude of Sardinia was known as 9W, just that an analysis of the Portolan charts shows that the correct longitudinal spacing was drawn for these charts and thus we can use our terminology and system of co-ordinates for descriptive purposes. The position of the 0N or Equatorial line is again a nebulous alignment. It had not been surveyed in 1457, and thus the use of Ptolemy’s zero, which is shown to be 31 degrees south of Alexandria, (which was a well known latitude in antiquity), and now accords with that fixed point of our cartographer’s layout in general. Thus the basic graticule arose and is a series of 31 degree squares, not 30 degrees as one would perhaps expect. 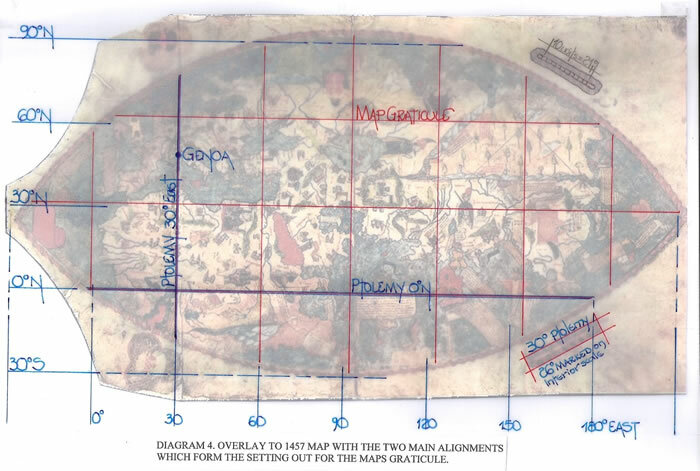 The difference is quite irrelevant, but can be shown to exist and thus we can speculate that the original intent was quite probably a 30 degree graticule, which like the bordure, suffered from a little inaccuracy of measurement in its planning stage. It is easy to illustrate the 31/30 grids by the location of features in the SW, SE and NE quadrants using the Claudius Ptolemy co-ordinates from his Geographia. Thus Diagram cg1457/D05 has appended the Ptolemaic graticule for the whole map including Europe, the NW quadrant. 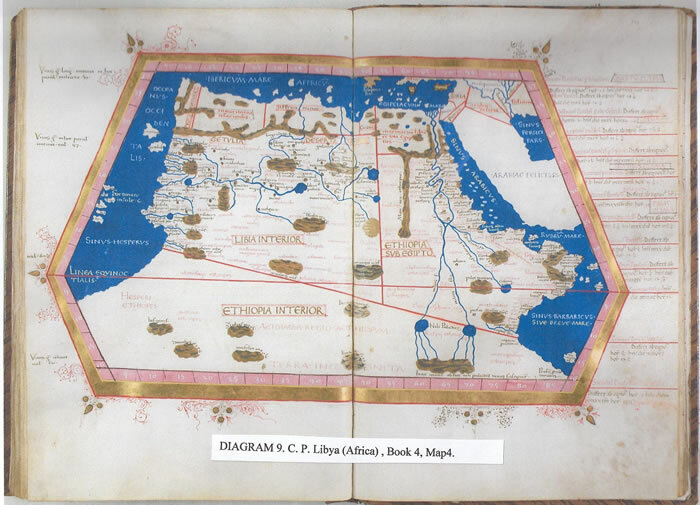 However, there are peculiarities within the drawing of the Ptolemaic section of the map as Diagram cg1457/D06 illustrates. As discussed, from the beginnings of cartography 14 the 36N latitude was a well established feature. But, perhaps because of the lack of overall space, given the size of the vellum used, (it is only 2/3rds the size of a vellum sheet for a Portolan which only encompasses Europe from the Iberian Peninsula to the Black Sea), and the necessity to meld a Geographical Europe to a Ptolemaic Oikoumene, some of the major features were of necessity moved. The Imaus Mountains, the source of both the Indus and Ganges Rivers have been drawn at 41/43N instead of 36N, thus moving not only the Caspian Sea northwards but it is drawn latitudinally twice its size. Longitudinally it is the correct Ptolemaic length though set several degrees to the east. Thus we can safely state that the majority of the 1457 World Map is a direct copy of the data contained in the Geography of Claudius Ptolemy which had been translated into Latin in 1406 by Jacopo Angelo di Scarparia at Rome, and thus we have an up-to-date map. The lines of the graticule are the basic parameters for the maps construction and the sloping lines which, are either 45 degrees, or set across two squares thus giving the 1/2/√5 ratio. This is not the wind sections of the circle in multiples of 11 ¼ degrees for the 32 winds. They are thus purely construction lines from the base plot of the map. As to the -painted scales- stated as representing either 100 or 50 mile units, that is surely incorrect. 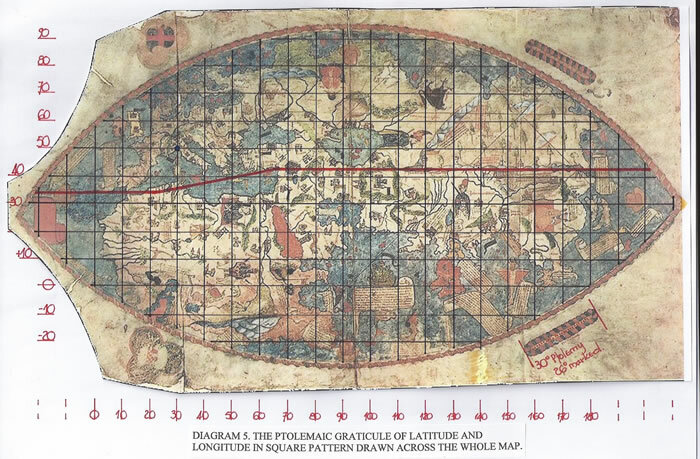 The cartographer has drawn the scales to represent the Ptolemaic grid used to construct the map. The southeast scale bar has 26 internal divisions, but crucially it is 30 divisions long externally. These divisions represent a single degree Ptolemaic and hence are 500 stadia each which equates to 92.5Km or 57.48 statute miles. 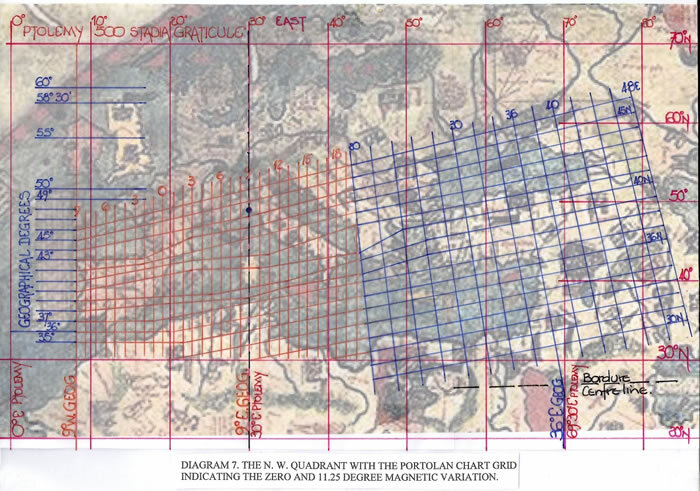 That the scale bar does not represent the main graticule tends to confirm that the two parts; main graticule and Ptolemaic grid are not the same measurement and there is one part in 30 differences, the 30/31 degrees discussed earlier. The second scale bar has 10 sections (although there could be one more) and they represent 21 degrees Ptolemaic total. Thus, “Whether the mapmaker took measured distances as the basis for his scales or whether he painted scales as pretence”- is certainly not-” irrelevant to the maps construction and thus spatial conception”. Indeed I believe the opposite. The N W Quadrant: Portolan Chart? There is adequate on line research into the geographical graticules which are the basis of a Portolan chart16 and their magnetic deviation. Many use the ‘MapAnalyst’ programme (freely available online) to determine the scale, juxtapositions and deviation within the charts construction. Cited are sufficient examples17 to obviate the necessity of textual proof here-in. But, Diagram cg1457/D07 illustrates the melding of the Portolan Europe to the Ptolemaic graticule with the 0E longitude positioned 2 ½ degrees from the coast line of West Africa, and the 30E longitude supplanting the geographic 9W longitude. Thus from Italy and Genoa west to the Iberian Peninsula it is a geographical representation, with a separate longitudinal scale being utilized as recorded. Two scales meld at 20E geog/45E Ptolemaic to form a magnetically based alignment which extends to 48E geog, the Caspian Sea. The cartographer, however, has been clever in the melding of the overall European graticule with the Ptolemaic. The Mediterranean Sea is geographically determined in the east by the 36E longitude. This is also the 69.5E [70E] of Ptolemy. They link together very close to the maps centre line, but actually join at the bordure asymmetrical centre line: although I would guess that is part of the drawing error. 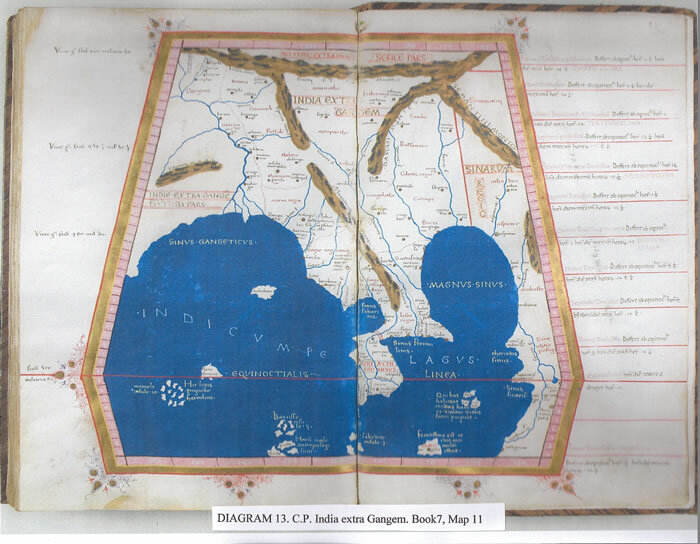 The cartographer has obviously considered this juncture in planning the maps layout upon the vellum. The defining feature of the eastern Mediterranean is the Gulf of Issus at 36E. The length of the Mediterranean is not determined by the Portolan Chart, as the Portolan Chart has a much shorter length longitudinally than the Ptolemaic map. Thus we see the 36E geog equals the 69.5E [70E] of Ptolemy and the cartographer can just fill the void of the Mediterranean Sea area with a map of suitable scale. Thus, with from 2.5E to 69.5E Ptolemaic degrees, that is 67 degrees longitude to utilize and only a geographic length of 9W to 36E or 45 degrees of longitude to accommodate, the cartographer could expand the scale of the Portolan portion of the map to suit. It leads to the conclusion that there was a large amount of preplanning before the map was drawn particularly to align the Ptolemaic 30E to the geographical 9W and thus pin-point Genoa. “I do not think it derogatory to Ptolemy if I do not follow his Cosmografia, because, to have observed his meridians or parallels or degrees, it would be necessary in respect to the setting out of known parts of this circumference, to leave out many provinces not mentioned by Ptolemy. But principally in latitude that is from south to north he has much terra incognita because in his time it was unknown”18. Thus we have two cartographers with very differing views of the work of Claudius Ptolemy. Still it must be recognized that in respect to the Indian sub-continent, the map of Fra Mauro is totally incorrect with the Indus adjacent to the Ganges and the cities of the Arabian Peninsula upon the wrong side of the Persian Gulf. Yet both would have no doubt had access to the same texts and in time-scale are certainly contiguous. 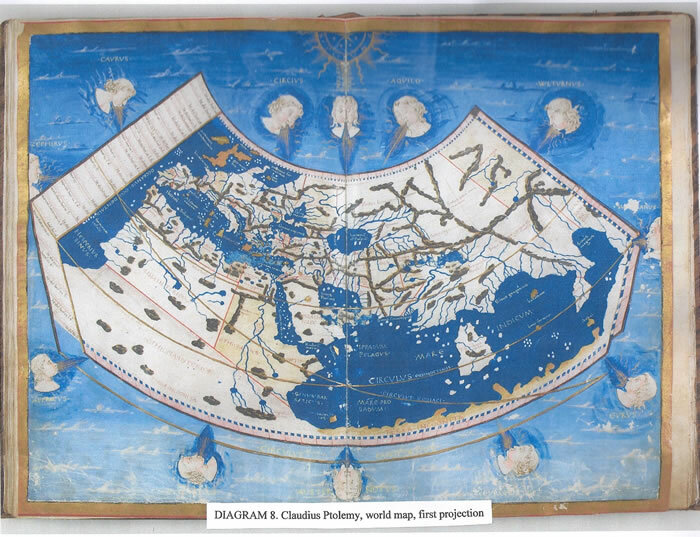 Therefore, although the Fra Mauro Mappa Mundi is huge in comparison, measuring some two meters diameter, the 1457 World Map displays greater integrity through what it portrays with its visual appearance: an amalgamation of a Portolan chart and the residual oikoumene of Claudius Ptolemy portraying a perceived reality. Thus perhaps it is not wise to consider maps portraying mostly a spatial model when, in not being able to dissect their inner workings, the fundamentals of the map, its scale and geometry, authors project their limited (albeit useful in other contexts) view, or the view they consider applicable from the maps decoration. The cartographer may have had to fulfil the requirements of a client, for what would he have drawn left to his own devices? The following diagrams are copies of the maps drawn in the 15th century to illustrate a copy of the Geography of Claudius Ptolemy. They are the World map drawn on his first projection; the map of Libya (Africa); Map of the Arabian Peninsula and Persian Gulf; map of the Caspian Sea etc; map of India between the Rivers; map of the Golden Chersonesus; and the map of Taprobane19. A full description of the work of Claudius Ptolemy and Marinus the Tyrian, along with Eratosthenes and the ancient authors mentioned in the text are available on this site. This also includes papers on many geographical features such as the Aral Sea and Architectural papers, such as the work of Vitruvius. These are freely available for research. My text, as above, was sent to R Pujades i Bataller, but he considered his text correct! But, I must ask how can you mistake lat/long graticules for wind directions? 2 Gerda Brunnlechner, The so-called Genoese World Map of 1457: A Stepping Stone Towards Modern Cartography? Peregrinations: Journal of Medieval Art & Architecture, volume 4, number 1, (Spring 2013). 3 Ramon J Pujades, “Les Cartes Portolanes”, (Barcelona, Institut Cartografic de Catalunya,2007) pp410-522. 5 Andrea Bianco, 1448, Atlante Nautico. (Venice,Arsenale Editrice per Banco San Marco, 1993). S A Bedini, ed. Christopher Columbus and the Age of Exploration, An Encyclopedia. (New York, Da Capo Press, 1964). pp 249-266. 7 Herodotus, The Histories, (trans. A. de Selincourt). (London, Penguin Books, 1976) section 4:42 pp282-285. 8 Claudius Ptolemy, Geographia. There exists, Greek, Latin, and English translations, the latest by J Lennart Berggren and Alexander Jones, (Princeton, Princeton University Press, 2000). Digital copies of Latin versions held by the National Library Naples, Lat V F 32, and the Zamoyski Codex, Biblioteka Narodowa, Warsaw, Poland are available. 9 D W Roller, “Eratosthenes’ Geography”, (Princeton, Princeton University Press, 2010) p 176. 11 H Petroski, “The Pencil: A History of design and Circumstance” (New York, Random House LLc 1990) pp14-29. “Before the mid 1500’s “pencils” consisted of a thin rod composed of soft lead and were used mostly by artists”. 13 Claudius Ptolemy, Geographia, Book 1, Chapter 24, and Book 8, Chapters 1 and 2. 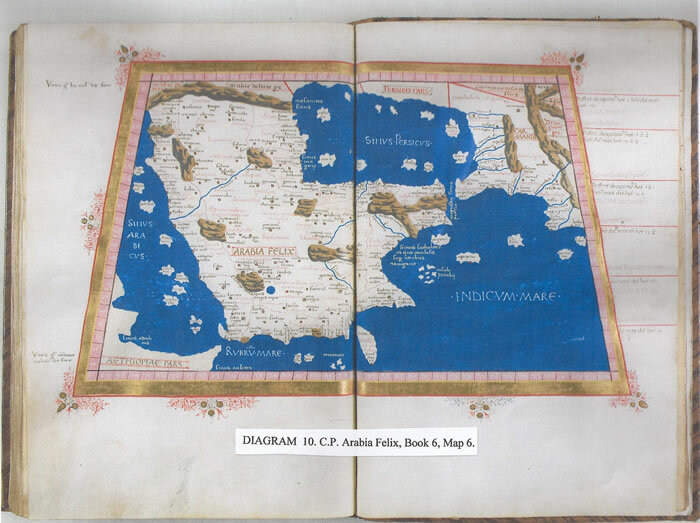 16 P Falchetta, “The Use of Portolan Charts in European Navigation during the Middle ages” (Venice, Stand, 2007) pp1-10. J F Alves Gaspar, “From the Portolan Chart of the Mediterranean to the Latitude Chart of the Atlantic” (Lisbon, Universidade Nova Lisboa, 2010), chapter 4. 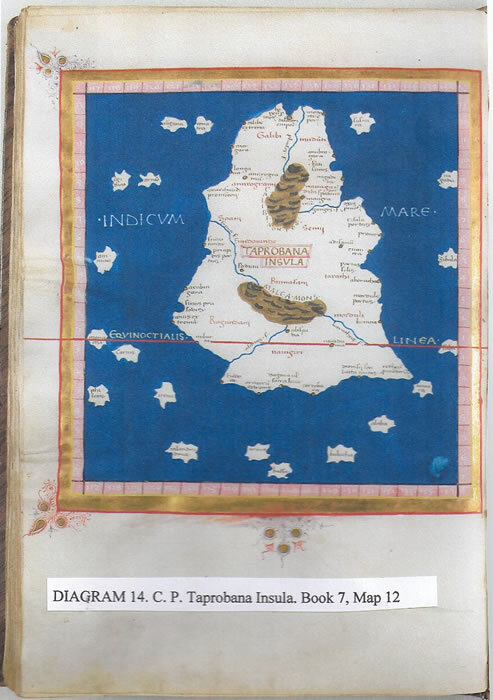 18 P Falchetta, “Fra Mauro’s World map with a commentary and translations of the inscriptions”, (Venice, Biblioteca Nazionale Marciana; Venizia (Turnhout, Belgium, Brepols Publishers 2006) pp 700-701, note 2834. 19 Cosmography, Maps from Ptolemy’s Geography. Introduction by Lelio Pagani. English edition by Magna Books, Leicester. 1990. 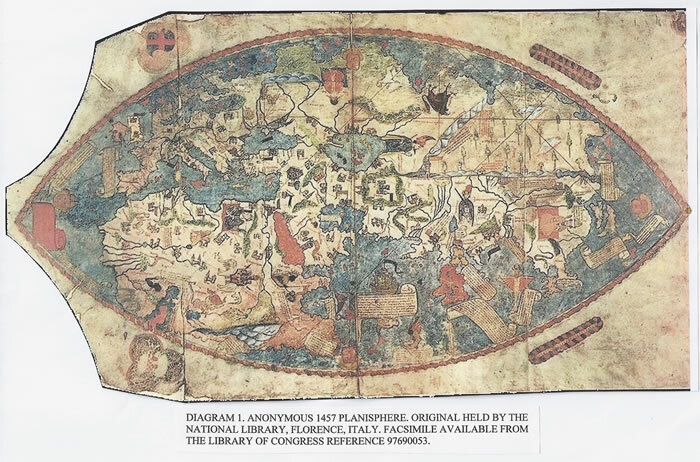 The maps from Codex Lat. V F. 32 (15th century), belonging to the National Library, Naples, Italy.